The first ROCCAT product we review turns out to be a winner – find out why we enjoyed the Kave XTD Stereo in our full review. Over the past few years we’ve reviewed a large number of headsets, headphones and other audio equipment – often geared towards gamers. It’s somewhat of a surprise therefore that we’ve never looked at any of ROCCAT’s offerings. ROCCAT has built up a solid reputation among gamers wanting top level equipment with gamer-oriented designs to match. The company is also a strong advocate for innovation, introducing new features or perfecting existing ones with nearly every new product they release. 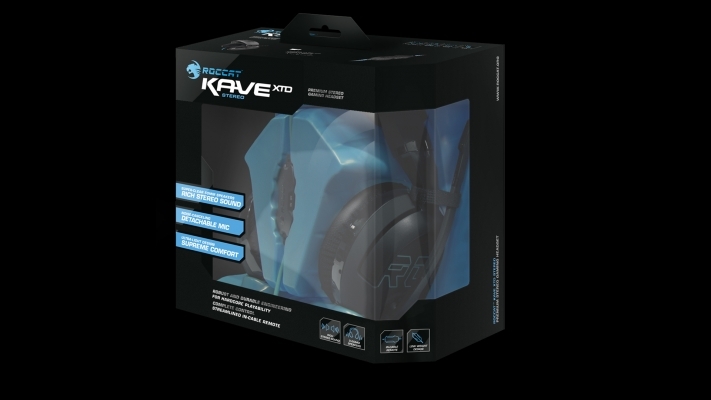 It is therefore perhaps with a touch of irony that our first ROCCAT review is of the Kave XTD Stereo headset, because this is a headset that focuses on mastering the basics instead of loading it with tons of new features. While we’ve seen a lot of headsets add features like (virtual) surround or led lighting features, ROCCAT’s latest is a ‘regular’ stereo headset that doesn’t light up with more colors than you can possibly imagine. This might seem like a step back, but it actually offers some benefits as well. Where most surround headsets and all of the ‘illuminated’ ones rely on a usb connection, the Kave XTD Stereo has regular jack connectors for your audio and mic functions. This allows you to use your (perhaps superior) sound card instead of relying on a built-in or usb sound card-based solution. Thinking outside of the pc box, this approach also makes it possible to connect this headset to an mp3 player or any other kind of audio device with a regular audio jack connection. Powering the audio experience are two 50mm drivers, whereas most headsets in this range opt for 40mm drivers. 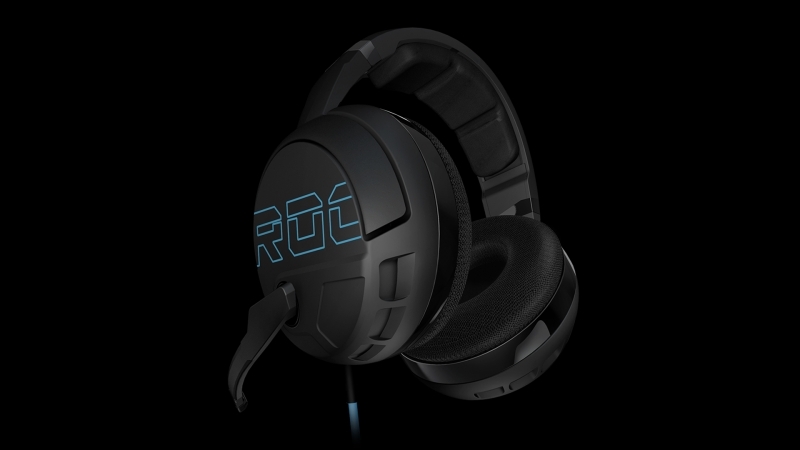 This demonstrates ROCCAT’s commitment to excellence with this headset, which also translates into its build quality. Rocking a familiar black and blue design, this is a headset that’s built to last. It doesn’t fold up and may look on the larger side, but despite this robust design the headset never feels heavy on the head. Part of this is due to an excellent level of comfort, with ear cups fitted with netted cloth cushions. Less ‘sweaty’ than (faux) leather and not as big of a dust magnet as fabric cushions, these are extremely easy to wear. The trade-off is that this material isn’t ideal in terms of noise cancelling, so keep your gaming environment in mind when considering this headset. Having said that – the Kave XTD’s ear cups are among the most comfortable we’ve ever worn, which is great when considering the price points of some of these headsets. In fact, the only ‘shortcoming’ we noticed in terms of the physical attributes of the Kave is its audio cable, which isn’t braided and feels a bit more prone to curling up and wearing over time – though this a minor issue in the grand scheme of things. Which brings us to what matters most – how does this headset perform? Extremely well, we’re happy to say. Perhaps due to the aforementioned 50mm drivers, this is a set of cans that produces a crisp soundscape across the board, performing just as well in games as it does in movies or music. We did most of our tests using a Creative ZXR sound card, which is an extremely high quality piece of equipment that exposes flaws more easily than on-board audio chips do. However, we also tested using smartphones and portable mp3 players, and those tests just confirmed what we learned when listening on PC: this is a great all-purpose headset. For a headset that is, relatively speaking, fairly bare-bones in nature, the ROCCAT Kave XTD Stereo is a tad more expensive than similar headsets. However, it more than makes up for this in terms of comfort and audio performance, making this a top choice if you’re in the market for a good stereo headset this holiday season.